This week I attended the #OER17 conference where the theme was ‘The Politics of Open’, followed by a BERA EdTech SIG seminar entitled ‘Critical and Theoretical Approaches to EdTech Research‘. Both events were superb in terms of their scholarly engagement in the topics of open ed, edtech and their critical, political and (inter)disciplinary aspects. What’s more, it was quite startling how much synergy there was between the two events, both of which have started me wondering about the role of women, or feminist perspectives, and the theme of care relative to openness and edtech. There are many reflections and curated resources coming out of #OER17. Indeed, I was going to write a reflective summary of the event myself. However, the tweeted snippets below prompted me to focus my reflection quite specifically on one aspect i.e. women, and/or feminism relative to openness, edtech, critical theory and political activism. Quite honestly, reflecting back, it hit me hard in the face that so many of the voices at #OER17 were those of women. Yeah, why were so many of the voices at #OER17 those of women? The 3 keynote speakers were women; the plenary panel comprised 3 women and the sessions that I picked out to attend, now that I look at it, were all made up of women (yes, all!!). Indeed, a FemEdTech initiative was launched at OER17. I have to say that although I was vaguely aware of this, I hadn’t specifically planned to go along. It just so happened that my lunch buddies were going, so I tagged along. I understand feminist critiques of power and issues of gender inequality but TBH I’ve never really identified myself to any great extent with the feminist cause. For me, class struggle has always seemed to override it. Consequently I’ve not paid as much attention as I ought to feminist issues or politics. Recalling Maha’s keynote, and in light of some further thinking, maybe OER17 has just provoked that particular seed with a little more intent. The Twitter conversation continued: it was wondered about the perceptions of others who attended the conference, particularly those of male participants/attendees. And that maybe my perception was a reflection of my network after all. So, still scratching my head, I decided to check this out against the conference programme. As a crude measure, I simply tallied the number of male and female names listed against each session in the programme. The figures go someway to validating my perception. 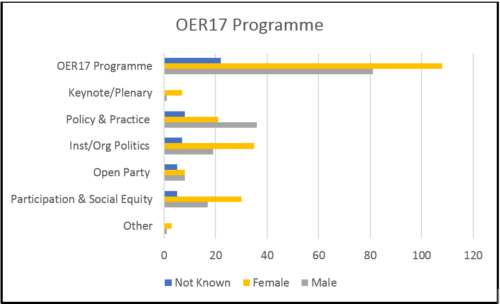 Looking at the OER17 programme, women outnumber men in the open space. They outnumber men in all categories except, wait for it…. ‘policy and practice’. Interestingly, women significantly outnumber men in both the categories of ‘institutional/organizational politics’ and ‘participation & social equity’. I’m not sure what the figures tell us, or if it’s anything surprising. However, the other thing I noticed is that openness is being shaped by a discourse of care, or things related to caring, which again has female connotations. 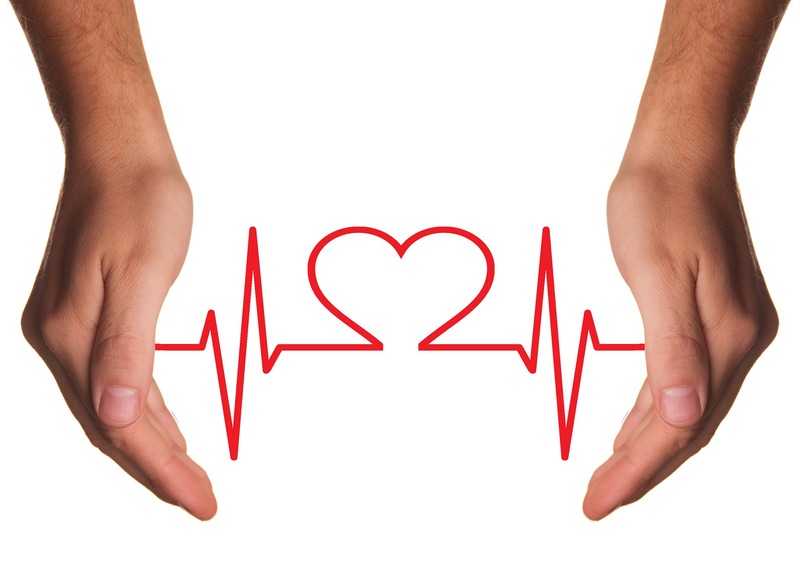 Both education and openness, in their deepest and truest senses, seem to converge on relationships of generosity and care between human beings. I think that’s important. It has implications for the future of open education, which to be true to both “open” and “education” needs significantly more intellectual and financial investment in understanding how to enable and support the development of these relationships of generosity and care. Indeed, Martin Oliver’s BERA keynote was entitled ‘why should we care?‘ It’s not so much ‘why should we care?’ because that’s not hard to answer, rather it’s why are open educators being summoned by a discourse of care, and to what ends? Why is it that critical or emancipatory approaches to edtech are also being called for using the language of care? In one of her sessions, Laura Czerniewicz asked “what is it we’re not seeing?” I wonder too, and I wonder where it is we need to look and from what position. It can’t be denied, there was much delight at OER17 regarding the critical turn that openness appears to be taking. Yet, as was noted at the plenary, it’s OK to talk the critical talk, but now we’ve got to walk the critical walk. I’m re- reading Stephen Brookfield’s ‘Becoming a Critically Reflective Teacher‘ at the moment (in fact an updated edition was released this week). It’s stirring stuff and quite sobering in equal measure. It talks about ‘difficult conversations’ and a ‘loss of innocence’. Therefore, given that power can operate through discourse and the disciplinary effects we impose on ourselves, it would seem that matters raised here might just apply to one, or both, of those categories. Either way, it looks like I’ve gotten myself a bonus OER17 #IWill. That is, #IWill engage critically and earnestly with feminist approaches and concerns relating to openness and edtech. So, who’s with me?